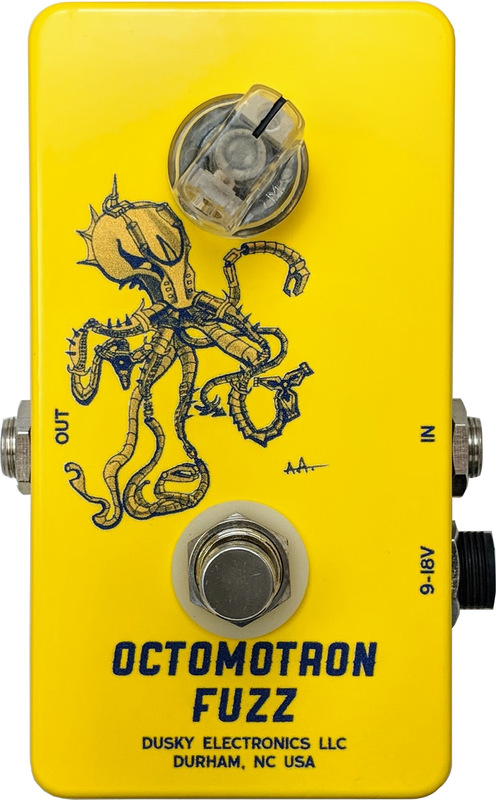 The Octomotron Fuzz is a new, boutique take on classic octave-up psychedelic fuzz made famous in the 60s. The Octomotron is a new, original circuit that works in a fundamentally different way, but the end result remains a deliciously distorted signal with a frequency doubling effect. An extended low-end response gives the Octomotron a brash, synth-like sound, equally at home on guitar, bass, or synthesizer. Unlike classic fuzzes and their modern clones, the Octomotron sports a modern, high-impedance input buffer, which guarantees it sounds good wherever you put it in your signal chain. The single glowing knob controls the output volume and, frankly, you should probably just leave it all the way up. Don't let the simplicity fool you, though, a wealth of timbre and texture is available based on where you play on the neck, your picking attack, how you've set your volume knob, etc. ... Classic ‘60s sound with a pronounced octave-up effect becomes most pronounced on guitar, using a neck pickup with single notes above the 12th fret. Power chords sound awesome through this as well, and effects reminiscent of a ring modulator are accessible by picking very lightly or turning down your guitar's volume. Again, another unworldly superb product from Dusky Electronics! This pedal is so musically dynamic and usable across so many different genres.